A bubbly tea made completely sugar free. BESTeas came to us needing branding and packaging for their upcoming debut. 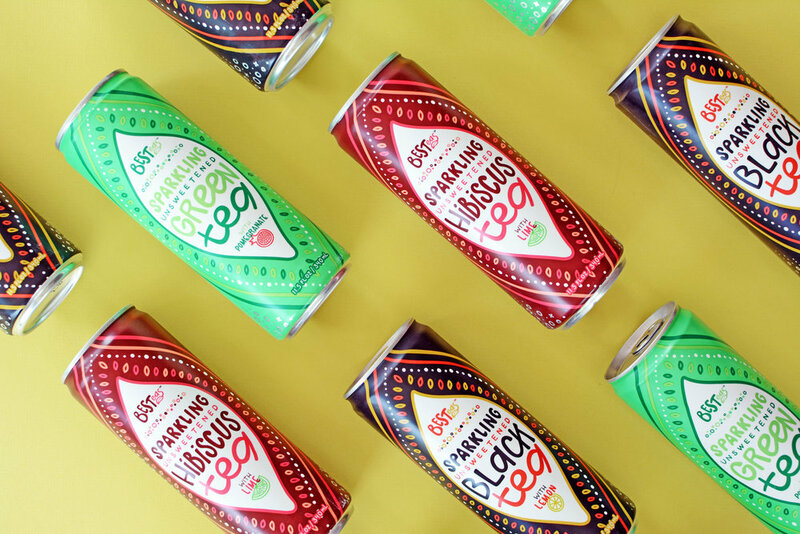 Made with no sugar and hints of real fruit and ginger, BESTeas wanted an eye-catching, handmade design to represent their brand. With three 16 oz flavors rolling out first, the BESTeas brand will also release five new flavors in the 12 oz cans. From concept to creation, both the logo and packaging are 100% hand-drawn. Check out the process below! We took a different approach to the typical "one color" logo. We wanted this brand to be lively & fun, not restricted. There is not one set color for the brand, yet it changes and adapts with the flavors. The logo process always begins with pen and paper. We often take up to 15 pages of our sketchbook just in the initial ideation process. We believe that a hand-drawn logo gives the most personality to a brand- original, unique, and one-of-a-kind. Then... we go straight to the whiteboard for critiques on all of our different concepts.